Sometimes the best way to save money is to simply stop buying something. I bought this case of bottled water last fall, probably six months ago. That’s right, six months ago, and it’s only half gone. And that’s only because my son got into it one day with a bunch of friends before we could stop them, otherwise there would be just a few missing. The only reason I have this case of bottled water is for school field trips or other events that require a completely disposable lunch. Otherwise, we use our own re-usable water bottles with tap water, filtered through our refrigerator. 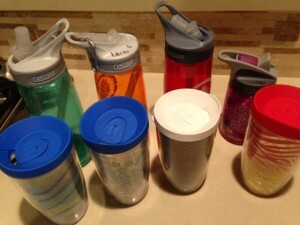 Each of my kids has a water bottle for school, sporting events, trips to the park, bike rides, hikes, or long car rides. The cups with lids are for use at home. 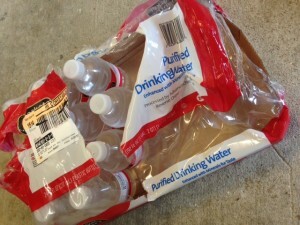 I haven’t done the math, but I know that before we started this habit, I spent A LOT of money on bottled water, as we would often grab one out of the garage fridge as we loaded up the car to head out. Now I buy maybe two cases of bottled water per year, if that much. A quick Google search showed that bottled water can cost up to 300x the cost of tap water. 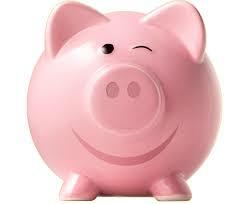 That’s a lot of money…..money I’d much rather spend on food for my family! So, if you have access to clean tap water, buy yourself a good re-usable water bottle and ditch the disposable bottled water.